“Only in painting have I found happiness,” Elisabeth Vigée Le Brun confided at the end of her long, prolific career. Though Vigée Le Brun’s high society portraits earned her great fame during her lifetime, her sentimental style fell out of fashion and she largely dropped off the radar. Her long overdue retrospective, “Vigée Le Brun: Woman Artist in Revolutionary France” opens at the Metropolitan Museum of Art in New York (February 15 to May 15, 2016). We first meet the artist in a terracotta portrait bust by Augustin Pajou. Born in Paris in 1755, Vigée Le Brun learned to paint from her father, a professional pastel portraitist. After his death, the precocious teenage talent went to work to support her family. At 21, she raised eyebrows by marrying a man twice her age, Parisian art dealer Jean Baptiste Pierre Le Brun. The marriage was short lived, but Vigée Le Brun’s well-connected husband helped her attract the notice of Marie Antoinette. Vigée Le Brun’s elegant brushwork and talent for painting luxe fabrics won over the young queen. Three full-length portraits are on view in the U.S. for the first time, starting with Marie Antoinette in Court Dress, a gift for her mother, Austrian Empress Maria Theresa. 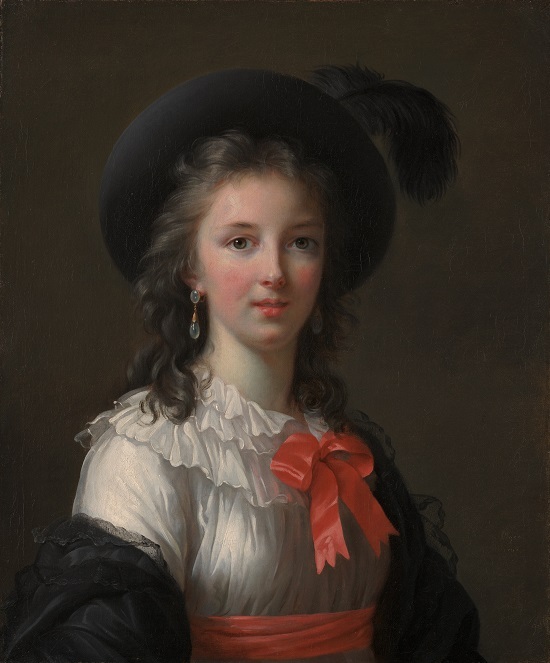 It took an edict from Louis XVI for the 28-year-old artist to gain admission to the Royal Academy of Painting and Sculpture — one of just four women members. Because women were barred from practicing history painting, Vigée Le Brun focused on portraiture, developing a unique style. She portrayed many of her female subjects informally, with loose, un-powdered curls and billowy chiffon dresses. Meanwhile, Vigée Le Brun’s royal patrons were growing increasingly unpopular. In 1787, in an effort to polish the queen’s badly tarnished image, Vigée Le Brun painted Marie Antoinette and Her Children, an ambitious propaganda piece depicting the queen as a devoted mother. Louis XVI and Marie Antoinette were soon arrested, tried, and beheaded. Because of her close relationship to the queen, Vigée Le Brun and her nine-year-old daughter Julie fled Paris in disguise in 1789. A savvy businesswoman, Vigée Le Brun turned misfortune into a lucrative career, producing flattering portraits of royals and courtiers across Europe. After her initial stay in Italy, Vigée Le Brun spent three successful years in Austria, followed by a six-year stay in Russia, periods well represented in the show. Interspersed throughout the show are four self-portraits, which Vigée Le Brun used to attract new clients. These include a recently discovered drawing from her twenties, along with a newly cleaned picture from Florence’s Vasari Corridor. Wearing a black dress trimmed in white lace and a red sash, holding palette and brush, Vigée Le Brun stops painting for a moment to look engagingly at her viewers. Three portraits of the artist’s daughter are also on view. Despite her celebrity, Vigée Le Brun got off to a shaky start with Russia’s Catherine the Great, who despised a sentimental double portrait of her young granddaughters. She had greater success with a more formal portrait of Catherine’s beautiful daughter-in-law, wisely adding a portrait bust of the empress to the background. A year after Catherine the Great’s death, Vigée Le Brun painted one of the empress’s early lovers, the deposed king of Poland, Stanislaw August Poniatowski. Vigée Le Brun would call Russia her second homeland. Vigée Le Brun returned to France in 1805, where her new clients included Napoleon’s sister, Caroline Murat, the future Queen of Naples, and Her Daughter. The exhibition closes with four later French period pictures from private collections. In another masterstroke of marketing, the septuagenarian dictated her memoirs, equally colorful portrayals of the personalities she’d painted.